Well, they had me at hello at the Fox Hollow Vineyards. 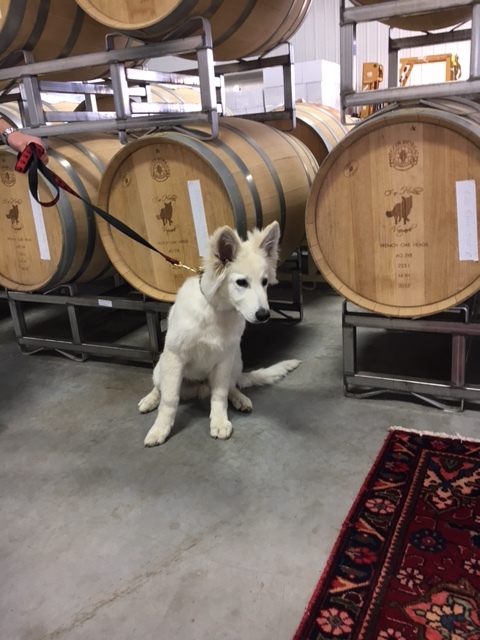 To be specific, Frederic, the winery’s handsome Berger Blanc Suisse (shepherd dog) got my attention as I walked through the door, sitting at the feet of his master, Joe Casola, the winemaker and vineyard manager. A winery dog is a wonderful thing! To go back a moment, as I turned off Holmdel Road onto a long, winding gravel road I drove for what seemed like a mile, with what looked like, not vines, but an orchard on my left. 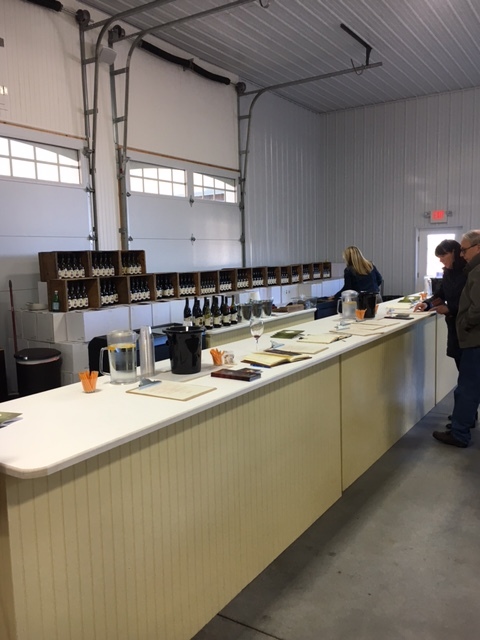 I came to a stop at the cavernous new building in Holmdel, New Jersey that serves as a combined winery, tasting room, and barrel aging room. It’s open, airy and welcoming if a bit antiseptic but frankly, it was a welcome relief from the too-often confines of small tasting rooms where you rub elbows with everyone even if you don’t want to. Anyway, Frederic was sitting inches from a stack of barrels, which take up a large part of the winery and add to its charm. 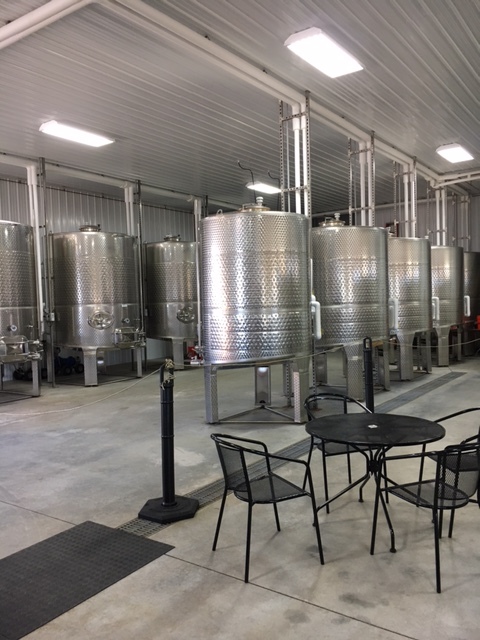 Across from the barrels is the very long tasting bar, and in the opposite corner are two rows of medium-sized stainless steel fermenters. Everything is very clean and orderly though I suspect at crush time it will still be clean, but not orderly! If you’ve ever visited a winery during crush, you know what I mean. Immediately I was welcomed by two tasting room attendants who offered up a small bag of oyster crackers (which I love for tastings) even before I could get out my pen and notebook. We made chit-chat as I surveyed the wine list, which offers three dry whites, four dry reds, one semi-sweet table wine and a dessert wine. To me this was a near-perfect list for a New Jersey winery – interesting stuff, and not too many varietals. I spent over an hour tasting, interrupted by conversations with Joe, with the tasting room folks and petting handsome Frederick, who took the liberty at one point of walking back behind the bar and curling up on the floor, oblivious to everyone and everything. You have gotta love that! Turns out that this has been a family farm and orchard for generations, and has only been open to the public as a winery since last fall, although the first vines were planted in 2010. And if you know anything about grapevines, you know it takes at least 3-4 years before you get any suitable fruit from new vines. Joe, who looks like he’s about 19 (I think he’s a bit older), talked to me briefly about his time at enology and viticulture school (that’s winemaking and grape growing) at a college in North Carolina, where he also got some experience at local wineries before returning to Jersey. Riesling 2015: Both fermented and aged in stainless so it’s a very bright and brisk Dry Riesling. Great nose. Barrel-Aged Riesling 2014: This one, also dry, sat around in some oak for awhile and is much softer and rounder with a nice mouthfeel. I really loved this despite my usual penchant for brisk whites. Barrel-Aged Chardonnay: A buttery-nosed elegant Chardonnay with a lot of vanilla. Chambourcin 2014: Very light and dry, with a distinct cranberry flavor. Not my cup of tea, so to speak, but well made. Chambourcin is French-American hybrid grape often found in the northeast and Midwest US. Cabernet Franc: This was a good example of a finicky grape that is more often used a blending wine than a varietal. Light nose with a nice sour cherry flavor. Cabernet Sauvignon: Classic Cabernet, dry and leathery, with just enough tannin. Field Master Blend 2014: A mix of 80% Cabernet Sauvignon and 305 Cab Fran, this is a lovely, medium to full-bodied wine with notes of black cherry and a very long finish. My only quibble here was that t $40, it’s rather pricey for Jersey juice. Nonetheless I bought a bottle and am looking forward to having it with a meal very soon. Traminette 2014: Just loved this. Light, and lightly-sweet, this would be great with cheese before or after dinner. Traminette is a cross between Gewürztraminer and the French-American varietal Johannes Seyve and does pretty well in the cold. Autumn Harvest 2013: This is a true dessert wine although it’s not nearly as sweet as an Icewine or Sauternes. Sadly this is the wine I liked least.